ONLY 11 DAYS UNTIL THE OPENING CEREMONIES! I just wanted to give you an update and some ‘behind the scenes’ athlete info as we move into the final prep stage for the games. I have been in Europe for the past 3 weeks competing and training. I raced in Canet, France, Barcelona, Spain and Rome, Italy. All of my races went really well and I posted times faster than I ever have in season. Things are looking great for me as we approach the summer races. We had a short training camp in Ostia, Italy where we got to eat tons of fresh Italian pasta, mozzarella, tomatoes, ect. every day. We definitely had to show a bit of restraint though considering we want to be our leanest (and meanest) right about now! 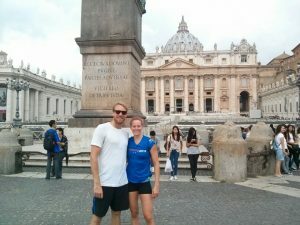 My cousin Conlin McCabe was in Italy at the same time as me with his rowing crew (who will also be competing at the Pan Am Games). Even though I didn’t get to see him, it was great to chat to him about Italia, formaggio and prepping for the summer. Keep an eye out for him and his team as they go for gold in both the men’s 4 and the mens 8+ boats. 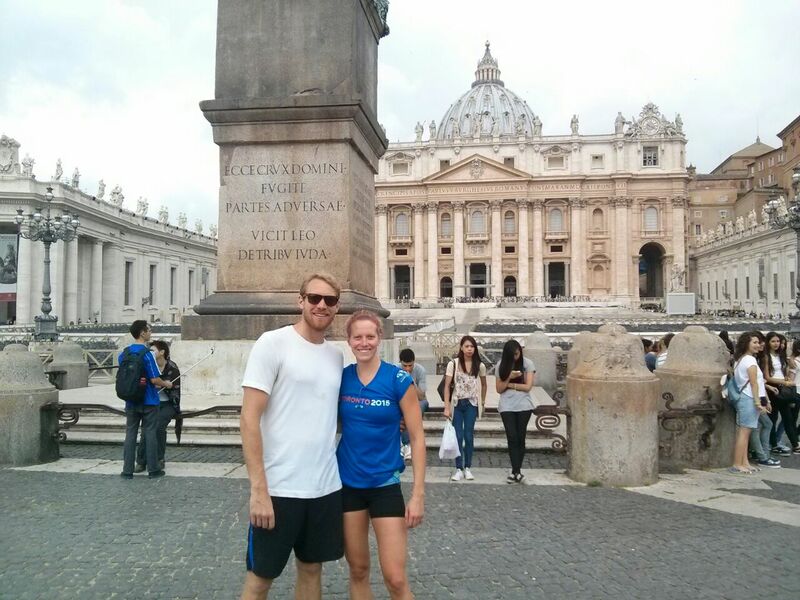 Our swim group had a bit of time to check out the cities, but for the most part it was business. 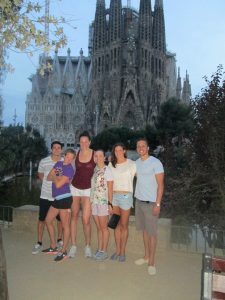 I traveled with the high performance centre of Ontario (a group of about 7 swimmers + 3 staff/coaches). It was a nice group, but I think we were all happy to get home to our own beds by the end of the trip. There is one event I must mention that I’ll be taking part in before Pan Ams start. I will be a torchbearer on Sunday July 5th in Scarborough (875 Morningside Ave – at the pool) at 3:00 pm. I encourage you all to come out if you’re around. I will run for about 200m with the torch and it should be a pretty special moment! We gather as a swim team in London, Ontario a couple days before the opening ceremonies. None of us swimmers will be attending the ceremonies because like I said – we need to be resting, and often those events cause all participants to be on their feet for a long time. We move from London into the athletes’ village on July 12th. It will be great moving into the village and seeing all the other athletes but at that time it’s only a couple days until racing begins so we’ll have to stay focused and ignore a lot of the distractions that will be around. My race(200m breaststroke) is Wednesday July 15th and the finals begin at 7:00pm. I have to qualify for finals through the heats swim in the morning (top 8). The swimming competition finishes on the 18th and on the 19th we pack our bags up and a small portion of the team will head to Spain to prepare for the World Championships in Russia. My race at the World Champs in Kazan, Russia is on August 6th. Pan Ams will fly by for me, but I know it’s going to be a blast and I hope you all get to be a part of it. Get your red and white out and be proud to be a Canadian!!!! Have a great games experience, thanks for following along and GO CANADA GO!!!! !